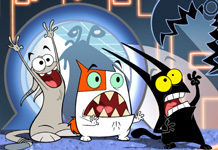 Catscratch!. প্রতিমূর্তি from the Nick show: Catscratch.. Wallpaper and background images in the Nickelodeon club tagged: nick nickelodeon catscratch. প্রতিমূর্তি from the Nick show: Catscratch. This Nickelodeon photo might contain নকল মানুষের, কমিক বই, কমিকস, and কার্টুন.